On Thursday, September 30th from 6:30 to 10:30 p.m., CCT will host their 4th annual exhibition “Inspired by the Beat” at the Cisneros Fontanals Art Foundation (CIFO) in Miami. All event proceeds will go to funding the organization’s art programs, which focus on helping children with special needs in the Miami community. This year’s event will feature local artist David ‘LEBO’ Le Batard alongside 23 artists from CCT’s Artistic Realization Technologies program. Four collaborative works between the Artists of CCT and LEBO will be auctioned off at the event, which will also feature the debut of “LEBO Live” – A multimedia experience including: live painting, video mixing, and music. 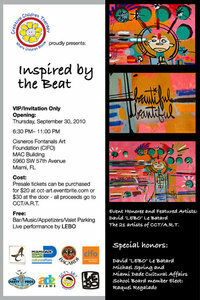 LEBO’s new coffee table book, Inspired by the Beat will be available for viewing and purchase at the event. CCT is dedicated to improving the quality of life of children with special needs through “superior therapeutic intervention.” In addition to providing medical services, the main goal is to provide creative programs that help these kids develop socially and artistically. For more information and to purchase tickets go to www.cct-art.eventbrite.com. 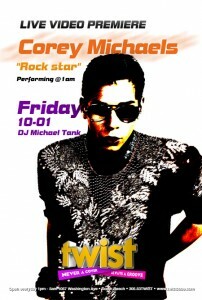 Miami-based recording artist Corey Michaels will premiere the music video for his infectious first single “Rockstar” from his debut album, Who Killed the King?, with an exclusive performance at TWIST on Friday, October 1st at 11 p.m. The music video will premiere in the Frolic Video Lounge at 1:00 a.m., followed by a performance by Michaels. After the performance, Michaels will be gifting t-shirts and copies of his album to his fans during a meet and greet/signing period. Who Killed the King? is available now at the iTunes Store (http://tinyurl.com/CoreyMichaels). On Saturday, October 2nd, join Miami Children’s Hospital Foundation for the 2010 Diamond Ball. Start the social season with the party of the year – take a step back to 1950, to an evening of glamour, cheek-to-cheek dancing and culinary delights as they celebrate the 60th Anniversary of Miami Children’s Hospital! This year’s theme “Diamonds…Forever: “Honoring the Past. Celebrating the Future”- Commemorating Miami Children’s Hospital Diamond Anniversary – 60 Years of World-Class Care – Anniversary Celebration to honor the legacy of medical excellence while celebrating the future of our children. Barbara and Jack Nicklaus – the first family of golf, champions of children’s causes, and partners in Palm Beach County – will be inducted into the Ambassador David M. Walters International Pediatric Hall of Fame for their work on behalf of children. Guests will enjoy performances by Cuban-American Grammy Winner Albita, Bruce Green Orchestra and Anthony Bucciero. The event will be held at the iconic Fontainebleau Miami Beach 4441 Collins Ave, Miami Beach. For more information, contact Morgana Rolle at mrolle@mchf.org or 786-624-2038. Professionals behind artists such as Miley Cyrus, Taylor Lautner, Dakota Fanning and hit movies like Harry Potter, Transformers, The Da Vinci Code and High School Musical are looking for their next star. Hollywood Across America, a hands-on workshop and showcase led by entertainment industry veterans, is coming to South Florida on Saturday, October 2nd and Sunday October 3rd . Local actors, models and other aspiring talent interested in learning from some of Hollywood’s top industry professionals will enjoy a weekend full of seminars, coaching and performances at Miami Beach’s Sea View Hotel. The two day event will be held at the Sea View Hotel, 9909 Collins Avenue, from 9 a.m. to 5 p.m. each day. Tickets cost $445 (payment plans are available). Talent ages: 6 and up. For more information go to www.hollywoodacrossamerica.com or call producer Sherry Faith at 305-899-2288 and/or 561-239-5445. On Thursday, October 7, from 5:00 to 8:00 p.m., reality show vixen Evelyn Lozada will host a private cocktail celebrating friend and renowned Italian shoe designer Francesco Sacco. Held at Lozada’s trendy shoe boutique Dulce, located on Miracle Mile, the intimate event will offer an exclusive preview of the designer’s new collection. Esteemed guests, including guest of honor Francesco Sacco, will enjoy complimentary champagne and cupcakes provided by Stella’s Sweet Shoppe. Shoppers will also have the opportunity to have their new Francesco Sacco stems signed by the designer, for a truly enviable pair of soles. For more information call 305-864-3434 extension 122 or Dulce@taraink.com. Sip & Spa at The Palms Hotel is back! The popular weekly happy hour at Essensia Lounge returns on Thursday Oct. 7th with great drink and food specials which include half-off all appetizers and cocktails from 6:00 to 10:00 p.m. plus complimentary Chandon Rose Brut between 6:00 and 7:00 p.m. In addition, The Palms AVEDA Spa is offering half-off all spa services from 4:00 to 9:00 p.m. Throughout the month of October, The Palms Spa joins AVEDA’s efforts in raising funds for the Breast Cancer Research Foundation, a nonprofit organization dedicated to funding clinical and genetic research on breast cancer at medical institutions across the globe. The Aveda Pink Ribbon Hand Relief™ will be available for purchase with a portion of the proceeds benefiting the Breast Cancer Research Foundation. The Palms Spa is also donating 10% of their pink nail polish sales to BCRF. Sip & Spa takes place every Thursday night from 6:00 to10:00 p.m. at Essensia Lounge and from 4:00 to 9:00 p.m. at The Palms Spa. Valet parking costs $9 for Sip & Spa guests and is complimentary if combined with dinner at Essensia Restaurant. For more information visit www.thepalmshotel.com or call 305.908.5458. The Palms Hotel & Spa is located on 3025 Collins Avenue.